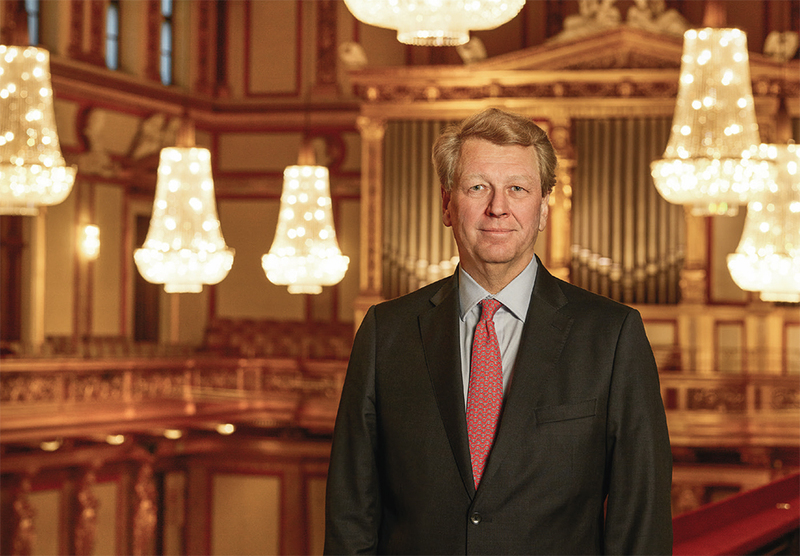 For 30 years now, the Vienna Musikverein has been headed by Thomas Angyan in his capacity as Director of the Gesellschaft der Musikfreunde. In this interview with mdw Magazine, Musikverein Director Angyan explains why he’s putting on a music festival despite the Vienna Festival’s withdrawal and also speaks about children’s and youth projects, planning phases, budgets, and Leonard Bernstein. Dr. Angyan, the Vienna Festival (Wiener Festwochen) has dropped its traditional music festival that had existed since 1953. In place of that, you’re planning to hold your own music festival from 10 May to 6 June. What moved you to make this decision? Thomas Angyan (TA): We decided to put on our own music festival because there is indeed a demand for music on the part of the Viennese audience and tourists at this time of the year. The festival will include 59 concerts, for which we’ll be printing around 70,000 tickets. One shouldn’t forget that the Vienna Festival originally also included a very broad-based musical programme involving the Musikverein, the Konzerthaus, the State Opera, and a number of other institutions. So even without the Vienna Festival, we want to continue offering the Viennese public the musical culture that they’d otherwise be missing—and we’ll be doing so on an alternating basis with the Konzerthaus. That’s been agreed upon for now and the years ahead, and it’s an arrangement we can rely on. So next year it will be the Konzerthaus’s turn, and it will once again be our responsibility in 2020. The Musikverein Festival Vienna 2018 will be built around three focuses: the Beethoven series with Franz Welser-Möst and the Cleveland Orchestra, Leonard Bernstein’s 100th birthday, and the 100th anniversary of Claude Debussy’s death. Franz Welser-Möst will join the Cleveland Orchestra, which is celebrating its own hundredth birthday in 2018, to present all of the Beethoven symphonies as well as other relevant works by Beethoven. We’re calling this the “Prometheus Project”. On one of the evenings Welser-Möst will speak about his approach to Beethoven, and I think he has quite a bit to contribute on the topic. TA: … will be focussed on above all by the Staatskapelle Berlin under Daniel Barenboim. Together with Martha Argerich, he and the orchestra will be performing several key works from Debussy’s oeuvre within the space of a week. And then, of course, Leonard Bernstein will also be extremely present in the form of several works by him plus a symposium. You knew Bernstein personally. What was he like as an artist and as a human being? TA: Bernstein is the reason why my career ended up having anything at all to do with cultural management in the first place. And Bernstein is responsible for my understanding of Gustav Mahler. Back in the ’80s, when I was heading Jeunesse, he was in Vienna every year—and his concerts were filmed. At the time, they still used 16mm cameras where you had to change the tapes every 15 minutes. And that, of course, was something that a “normal” audience found disturbing. So Bernstein said: “Let’s get a young audience in the hall.” And that’s how I first came to meet him. TA: In 1985, we were on tour together—it was the so-called Peace Tour—in Hiroshima. I was along as a representative of Jeunesse because the Jeunesse Choir was part of the performances. And those concerts were very moving. As an artist, Bernstein was something of a model for me. I tried to internalise everything that he conveyed artistically, as a teacher, and as a human being. And to this day, I have to go on YouTube and listen to his Musikverein performance of Haydn’s Symphony No. 88—which he DIDN’T conduct!—at least once a year. Watching his face and eye-movements … there’s nothing like it. TA: And we make a distinction there between concerts for young people and concerts in which we present young artists. One thing that really helps here is that we’ve built four new halls. And as far as young audiences are concerned, we have a situation where demand far exceeds supply. So we offer a variety of different concert series for different age groups. During the week, some of the concerts are exclusively for preschool classes, and we sell tickets to interested children and adults for weekend youth outreach performances. What are your preschool and school concerts like? TA: We make a conscious effort with these to also reach less-educated segments of the general public. And to certain non-public rehearsals, we specifically invite those school classes situated in the most difficult age group: the upper-cycle secondary school classes. These rehearsals are always followed by discussions with the artists where it’s not just about the music, but also about their lives. It’s an attempt to reach young people who might not think classical music’s so cool. And then there’s our cooperative arrangement with the mdw, which is very important to me. TA: One thing I make a point to do is to have the Webern Symphony Orchestra perform every year with well-known conductors, who’ve ranged from Riccardo Muti to Zubin Mehta and Pierre Boulez; this year, they’ll be playing under Christoph von Dohnányi. And by the way: it was the Conservatory of the Gesellschaft der Musikfreunde [Society of the Friends of Music] that, back in 1913, brought forth what’s now the mdw. TA: Today’s Gesellschaft der Musikfreunde doesn’t seek to play the role of a schoolmaster for music lovers. But we do want to offer a platform for young artists—like with our Rising Stars series, in which we feature musicians such as Harriet Krijgh and Emanuel Tjeknavorian. And Martin Grubinger got his start here, too. So these efforts have given birth to world-class careers. That’s another reason that it’s great we have these four new halls, where we can offer young artists the opportunity to play for the general public. What’s your general assessment of Austria’s young musicians? TA: The training they get, for example at the mdw, is outstanding. And I think that the music schools are also doing very good work, on the whole. But the situation in regular primary and secondary schools is unfortunately different. TA: Schools are offering less and less music instruction. That’s been severely cut back. And teachers who want to attend a concert with a class of theirs have to do so in their free time. What’s more, it’s regrettable that we here at the Gesellschaft der Musikfreunde receive no subsidies for our youth work—but we do it anyway. We view it as our obligation to provide young people with a way of accessing our musical culture. And quite generally, it would be so important to take music, literature, and the fine arts a bit more seriously. Speaking of subsidies: public funding is covering less and less. TA: Our annual budget is only covered in the amount of 1% each by funding from the federal and city governments. We’re currently waiting for the federal level to approve our request for a new three-year agreement. My goal there is to gradually, via several steps, get back to where we were in 2014. Which would be have federal funding cover a full 2% of our total budget. As for the City of Vienna, our current agreement with them has one year left to run and then I’ll reapply. So you’re already planning ahead for 2020? TA: Yes. And our planning for the musical programme of the 2018 Vienna Festival was already quite well along when, in the autumn of 2016, it was announced that the Vienna Festival would do without our participation because they weren’t interested in music performed like we do it at the Musikverein. As far as 2020 is concerned, we’ve got the big picture worked out and already have fairly detailed plans for the orchestral projects. TA: The Gesellschaft der Musikfreunde has the privilege of always being able to celebrate something: in 2020, the Musikverein building will be 150 years old—and of course we’ll also be celebrating the 250th birthday of Ludwig van Beethoven, who is one of our honorary members. This combination is sure to be one of the big themes of the Musikverein Festival Vienna 2020. So do you still view Vienna as the world capital of music? TA: Absolutely. And it’s something that audiences both appreciate and acknowledge.